DRM-free Steamworks title that retroactively and reactively syncs internal achievements when run from Steam. Includes Steam Music compatible soundtrack. Out of game configuration tool located in English at <path-to-game>/Config_EN.exe. 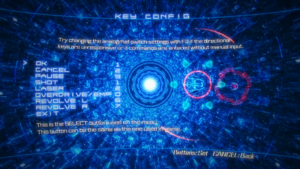 Open <path-to-game>/Config_EN.exe (or <path-to-game>/Config_JP.exe for Japanese). Check "Skip logo" under "Start-up activity"
"Game Option" where video and some other settings are listed. Resolution choices are limited to 11 different set values: 10 that are 16:9 and 1366x768 (FWXGA). Non-16:9 resolutions need to use an in-game aspect ratio adjustment method to adjust the screen and eliminate black borders etc. 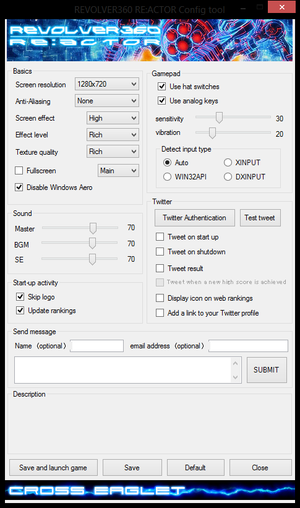 Has adjustable "screen effect" which includes post. Unknown if AF is included. "Key Config" for binding controller buttons. "Key Config" for binding keyboard keys. 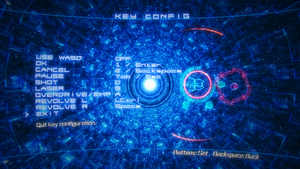 Directional movement keys can only be configured as either arrow keys or WASD. XInput and DirectInput. API, hat switches and analog input can be toggled from configuration tool if problems occur. 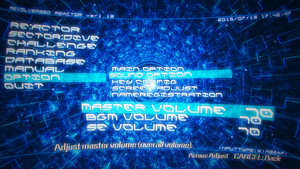 "Sound Option" showing the main menu and sound options. ↑ 2.0 2.1 File/folder structure within this directory reflects the path(s) listed for Windows and/or Steam game data (use Wine regedit to access Windows registry paths). Games with Steam Cloud support may store data in ~/.steam/steam/userdata/<user-id>/313400/ in addition to or instead of this directory. The app ID (313400) may differ in some cases. Treat backslashes as forward slashes. See the glossary page for details. 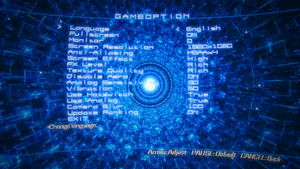 ↑ Famitsu - Innovative Rotating Shooter "REVOLVER360 RE:ACTOR"
This page was last edited on 29 December 2018, at 18:25.